Cornish Fishing, Cornwall Good Seafood Guide. 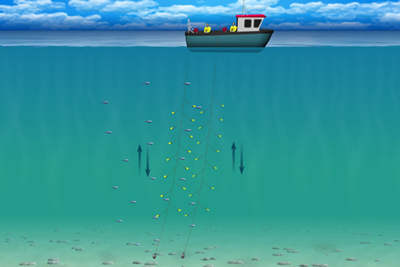 Beam trawls are heavy duty nets attached to a steel beam that holds the net open. The belly of the net is made of chains, and the upper surface is mesh. 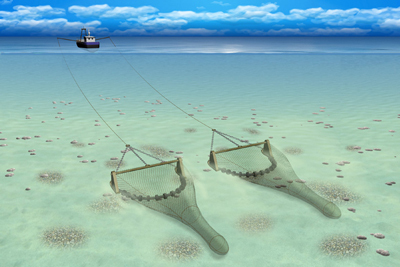 Beam trawlers pull two nets along the seabed simultaneously. 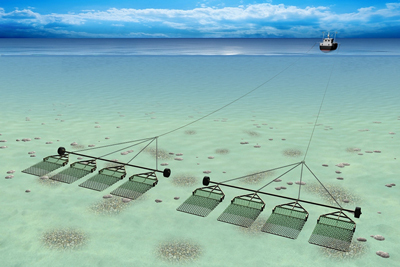 Demersal trawls are large nets that are pulled through the water with the bottom edge of the net touching the seabed. At each edge the net is held open by metal ‘trawl doors’. Demersal trawling is sometimes referred to as Otter trawling. Diving using scuba apparatus is a low impact method for collection of shellfish such as scallops. 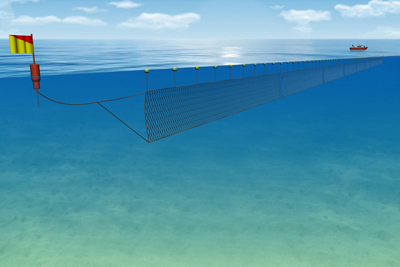 Drift nets are similar to gill nets but they are not fixed to the seabed. In Cornwall drift nets are used in small scale fishing mainly targeting sardines, herring and other mid water species. The practice of farming fish and shellfish is known as aquaculture. In Cornwall the main aquaculture species are currently mussels and oysters. 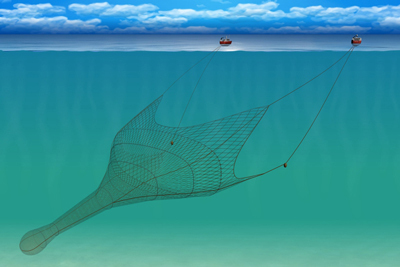 Gill nets are lightweight nets made of fine monofilament nylon line. They are virtually invisible to fish when in the water. 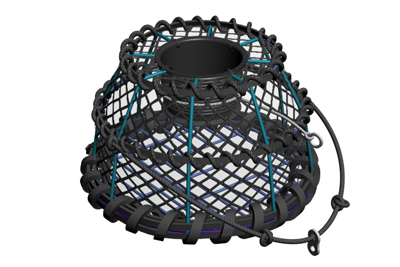 The nets are anchored to the seabed and fish of the correct size push their head through the mesh and become snagged on their gills, hence the name. Handline fishermen use hooks and lines to catch premium quality fish. This is a very selective method of fishing, and there is minimal effect on seabed habitats or bycatch of unwanted species. Undersized specimens can easily be returned to the sea unharmed. Seafood that is collected by hand from the shore. This is a very traditional occupation that is currently experiencing a resurgence in popularity in the UK. Longlines are a method of fishing that was once common in Cornwall but is now only rarely used. 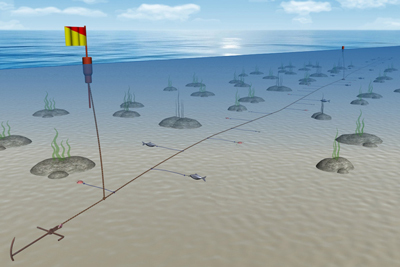 Baited lines (attached to a main line) are set on the seabed. They are left in the water for several hours before being hauled. The introduction of more efficient monofilament gill nets reduced the popularity of longline fishing. Pair trawling is a fishing method where a large mid water trawl is pulled by two boats working as a team, one on each end of the net. Baited pots are widely used around the Cornish coast. There are many different designs, and sthe ize and shape of the pots varies according to the species being targeted. The most common species to be caught by potting are crab, lobster and crawfish. 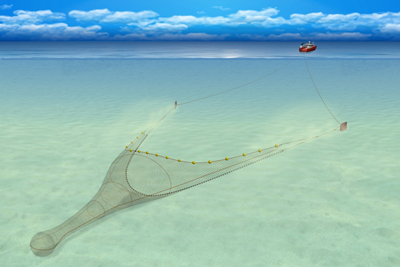 Ring netting is a method of fishing for mid-water shoaling fish species. It is used in Cornwall to target shoals of sardines, and occasionally anchovies and herring. 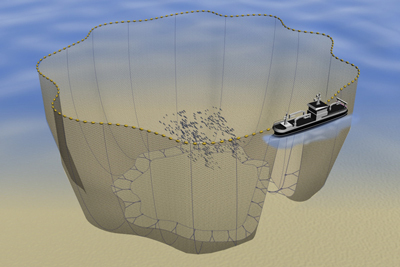 Ring nets work in a similar way to the much larger purse seine nets. An encircling net is shot around a shoal of fish, and a rope beneath the net then pulls it together encircling the shoal. Cornwall has a unique traditional Sail and Oar oyster fishery, made sustainable by a forward thinking ban on motors over one hundred years ago. The unique management of this fishery has resulted in a sustainable harvesting regime that has kept stocks healthy for 150 years. Scallop dredges are heavy-duty metal framed, toothed nets that are pulled over the seabed to target scallops which live buried in the sand or mud seabed. 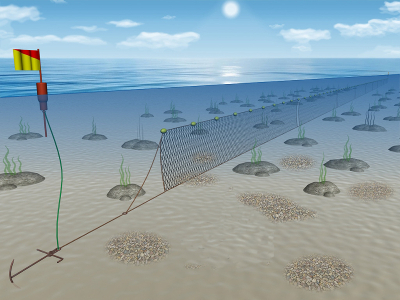 Trammel nets are multi-layered lightweight nets that are anchored to the seabed. 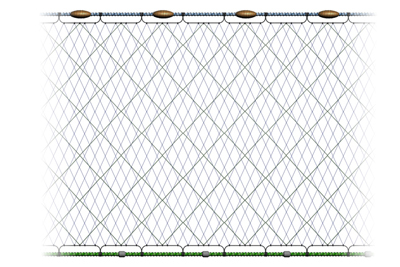 Unlike gill nets, trammel nets consist of 3 layers of mesh, the inner mesh is a small size and the outer layers have much larger mesh sizes. Beach seine net fishing is a traditional technique where a net is shot from a small rowing boat, in a semi-circle around a shoal of fish in shallow water. The net is then drawn in to the beach by teams of fishers pulling ropes attached to the ends of the net. This species may be caught using many different fishing methods. In this instance all methods have been scored universally by the Cornwall Good Seafood Guide.